U.S. Ends Funding For Palestinian Security Forces That Counter Militants The U.S. is ceasing aid to the Palestinians as a new anti-terror law takes effect Friday but will continue efforts to coordinate between Palestinians and Israelis. 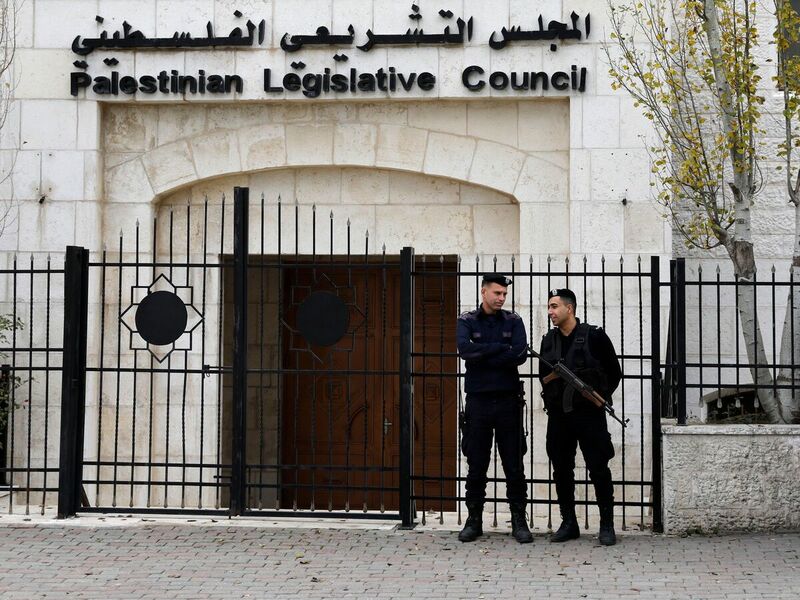 Palestinian security forces gather in front of the Palestinian Legislative Council building in Ramallah in the Israeli-occupied West Bank in December. The security forces patrol the Israeli-occupied West Bank, police areas under Palestinian Authority control and work to counter militants from groups such as Hamas and Palestinian Islamic Jihad. The forces share intelligence and coordinate their movements with Israel. They have received training and equipment from the U.S. since they were established in the 1990s. Now, American security consultants have cleared out their Jerusalem offices and returned to the U.S., Palestinian officials say. The Palestinian police say some officer training courses have been put on hold, as have new vehicles for special forces units. "American aid is at the core of the process of training Palestinian security forces," said the Palestinian police in a statement. "Many of these ongoing projects have stopped now." This comes as the United States slashes the last of its remaining aid to the Palestinians, putting an end to humanitarian and development projects in the Palestinian territories. The latest cuts are a result of the U.S. Anti-Terrorism Clarification Act, which took effect Friday. The law could expose the Palestinian Authority government to multimillion-dollar lawsuits by American victims of past Palestinian attacks if it accepts U.S. aid. Under these conditions, the Palestinian government has refused U.S. money, and the U.S. has abandoned wastewater and other development projects. "All [U.S. Agency for International Development] assistance in the West Bank and Gaza has ceased. So has U.S. security assistance to the Palestinian Authority," according to a U.S. official familiar with the matter who was not authorized to speak publicly about the issue. There is an exception to the cuts. The U.S. security coordinator's office in Jerusalem, which oversees U.S. and international assistance for the Palestinian security forces, will continue to operate, but on a limited scope. It has stopped train-and-equip activities funded by the State Department's international law enforcement bureau, but continues to facilitate security cooperation between Israel and the Palestinians, the official said. A Palestinian official, who spoke on condition of anonymity to discuss the sensitive security matter, said new money could be coming from the U.S. Defense Department to keep afloat the U.S. security coordinator's office. Funding from the Pentagon would not be subject to the same conditions of the anti-terrorism law. The U.S. official did not respond to NPR's questions about how the security coordinator's office would continue to be funded. The CIA is also believed to give funding to Palestinian intelligence officials, which is expected to continue. Israeli officials have lobbied Congress to pass an amendment to the anti-terrorism law, in order to keep U.S. money flowing to the Palestinian security forces. The U.S. budgets about $60 million in security funding annually for the Palestinian forces. "The security assistance is critical to Israeli security," said an Israeli official who was unauthorized to speak publicly. "A security force can't survive without equipment and training ... it's a death sentence." Palestinian officials also criticized the cuts, prompting sharp responses from Jason Greenblatt, an assistant to President Trump and special representative for international negotiations. In one of a series of tweets on Friday defending the administration, he wrote that the aid was cut at the Palestinian Authority's request "because they didn't want to be subject to U.S. courts." "Palestinians are too smart to continue to live as victims and recipients of foreign aid. Until a political solution is found (maybe it will be our peace plan? ), the PA must focus on helping Palestinians lead better lives. Blaming others doesn't work," he wrote in another tweet. Over the past year, the U.S. has slashed $300 million for Palestinian refugees and more than $200 million for humanitarian assistance, economic projects, medical aid and peace-building activities for Palestinians. U.S. officials say the cuts were made, in part, to pressure Palestinian leaders to cooperate with U.S. efforts to broker a peace deal with Israel. U.S. money for Palestinian security forces was not in jeopardy, until now. But an official from Palestinian President Mahmoud Abbas' office, speaking on condition of anonymity, said U.S. officials have assured Palestinian counterparts that U.S. aid to the security forces will be renewed eventually.